Click on the image below to open an interactive PDF of the guide, with links to more detailed information and articles. 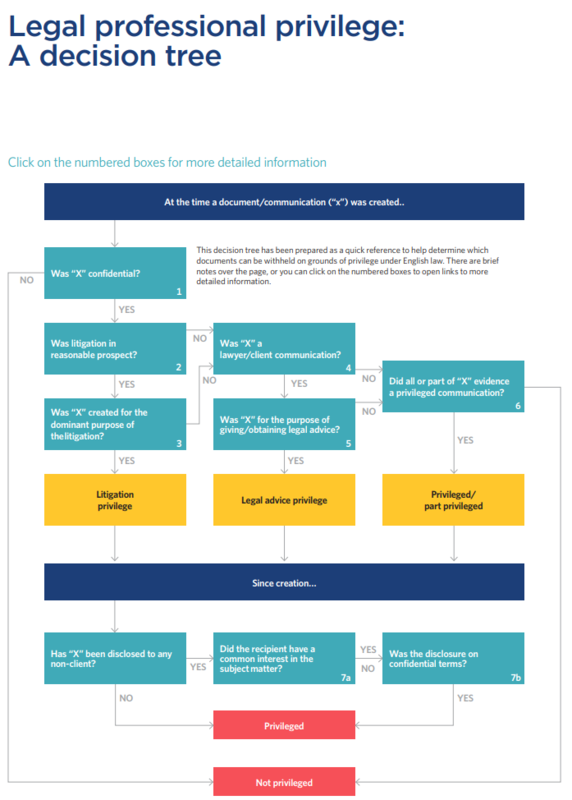 Once you have opened the PDF, you can view brief notes by hovering over the numbered boxes on the decision tree. Clicking on these boxes, or the icons on page 2 of the PDF, will open links to more detailed notes. Alternatively you can access the more detailed notes directly using the links below. There are two types of legal professional privilege, both of which require that the relevant communication or document must be confidential. it was created for the dominant purpose of the litigation. for the purpose of giving/obtaining legal advice. Privilege also applies where all or part of a document evidences a privileged communication. In some circumstances privilege can be lost where privileged material is subsequently disseminated.